Going to take it easy at the beginning of the week, will have a big meeting on Tuesday, so will save riding for Wednesday and Thursday. Will try and do 4 x 1:15 sessions, to take me up to 5 hours then save a ride for Saturday/Sunday with Friday off. A cold hit me Monday, just about managed my meeting on Tuesday, then had Wednesday/Thursday off work. So no training activities at all this week. The whole family down with it which made for a pretty rubbish week all round. Did make me wonder with two heavy colds in the space of two months, how much of this was due to over training. 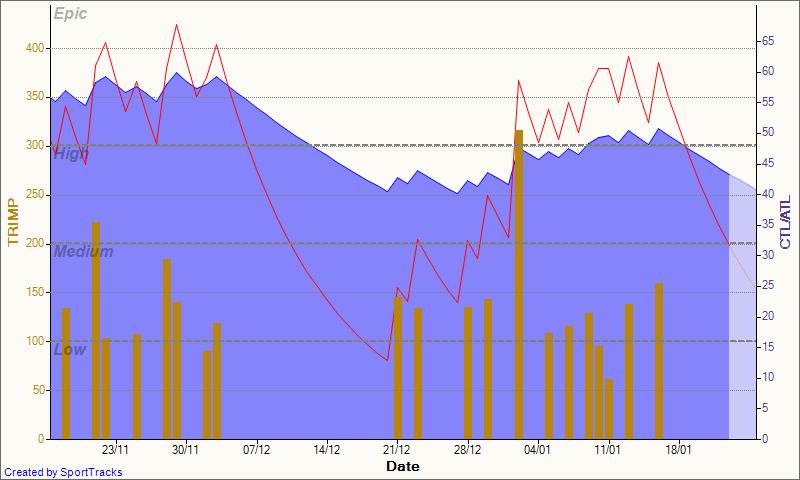 In an attempt to apply some science, I got the Training Load plugin up and running and analysed the period in question. In the graph the redline shows fatigue (or overtraining), the blue line is the fitness level, and the yellow bars show the intensity of training each day. All I can really say is that it looks in both cases that while I may have been slightly overdoing it, nothing major and I’d probably have got ill anyway, just one of those things. Thankfully next week is a recovery week anyway, so I’ll leave the training plan as it is.